Is Anger Ruining Your Health? Constantly losing your cool can hurt more than your relationships. People who are habitually angry also report feeling sick more often. Sometimes anger can be good for you, if it’s addressed quickly and expressed in a healthy way. In fact, anger may help some people think more rationally. However, unhealthy episodes of anger — when you hold it in for long periods of time, turn it inward, or explode in rage — can wreak havoc on your body. If you’re prone to losing your temper, here are seven important reasons to stay calm. 1. An angry outburst puts your heart at great risk. Most physically damaging is anger’s effect on your cardiac health. “In the two hours after an angry outburst, the chance of having a heart attack doubles,” says Chris Aiken, MD, an instructor in clinical psychiatry at the Wake Forest University School of Medicine and director of the Mood Treatment Center in Winston-Salem, North Carolina. “Repressed anger — where you express it indirectly or go to great lengths to control it, is associated with heart disease,” says Dr. Aiken. In fact, one study found that people with anger proneness as a personality trait were at twice the risk of coronary disease than their less angry peers. To protect your ticker, identify and address your feelings before you lose control. “Constructive anger — the kind where you speak up directly to the person you are angry with and deal with the frustration in a problem-solving manner — is not associated with heart disease,” and is actually a very normal, healthy emotion, says Aiken. 2. Anger ups your stroke risk. If you’re prone to lashing out, beware. One study found there was a three times higher risk of having a stroke from a blood clot to the brain or bleeding within the brain during the two hours after an angry outburst. For people with an aneurysm in one of the brain’s arteries, there was a six times higher risk of rupturing this aneurysm following an angry outburst. Some good news: You can learn to control those angry explosions. “To move into positive coping, you need to first identify what your triggers, and then figure out how to change your response,” says Mary Fristad, PhD, a professor of psychiatry and psychology at the Ohio State University. Instead of losing your temper, “Do some deep breathing. Use assertive communication skills. You might even need to change your environment by getting up and walking away,” says Dr. Fristad. 3. It weakens your immune system. If you’re mad all the time, you just might find yourself feeling sick more often. In one study, Harvard University scientists found that in healthy people, simply recalling an angry experience from their past caused a six-hour dip in levels of the antibody immunoglobulin A, the cells’ first line of defense against infection. 4. Anger problems can make your anxiety worse. If you’re a worrier, it’s important to note that anxiety and anger can go hand-in-hand. In a 2012 study published in the journal Cognitive Behavior Therapy, researchers found that anger can exacerbate symptoms of generalized anxiety disorder (GAD), a condition characterized by an excessive and uncontrollable worry that interferes with a person’s daily life. Not only were higher levels of anger found in people with GAD, but hostility — along with internalized, unexpressed anger in particular — contributed greatly to the severity of GAD symptoms. 5. Anger is also linked to depression. Numerous studies have linked depression with aggression and angry outbursts, especially in men. “In depression, passive anger — where you ruminate about it but never take action — is common,” says Aiken. His No. 1 piece of advice for someone struggling with depression mixed with anger is to get busy and stop thinking so much. 6. Hostility can hurt your lungs. Not a smoker? You still could be hurting your lungs if you’re a perpetually angry, hostile person. A group of Harvard University scientists studied 670 men over eight years using a hostility scale scoring method to measure anger levels and assessed any changes in the men’s lung function. The men with the highest hostility ratings had significantly worse lung capacity, which increased their risk of respiratory problems. The researchers theorized that an uptick in stress hormones, which are associated with feelings of anger, creates inflammation in the airways. 7. Anger can shorten your life. Is it really true that happy people live longer? “Stress is very tightly linked to general health. If you’re stressed and angry, you’ll shorten your lifespan,” says Fristad. A University of Michigan study done over a 17-year period found that couples who hold in their anger have a shorter life span than those who readily say when they’re mad. If you’re not someone who’s comfortable showing negative emotions, then work with a therapist or practice on your own to be more expressive. “Learning to express anger in an appropriate way is actually a healthy use of anger,” says Fristad. “If someone infringes on your rights, you need to tell them. Directly tell people what you’re mad about, and what you need,” she says. Our feet and ankles are very important, considering we couldn’t stand, walk, run, or roundhouse kick someone in the face without them. Unfortunately, our lower limbs tend to be neglected unless something goes wrong. Strong and flexible feet, ankles, and calves provide our base for stable movement, and are essential for performing our daily activities without pain or strain. 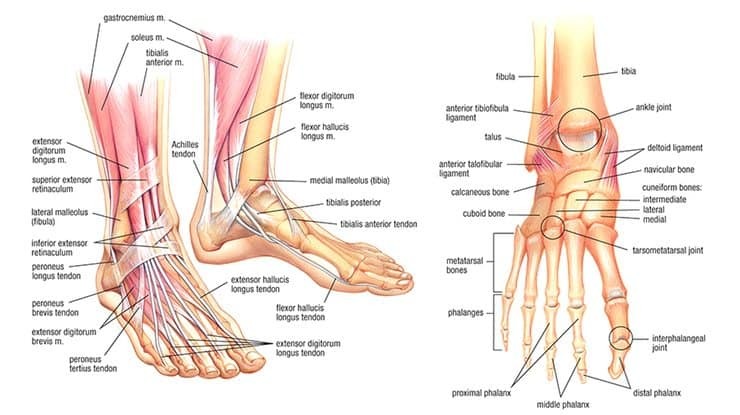 In this article, I will give you a brief introduction to the the basic anatomy and movements in the ankle and foot (just enough for a good familiarity, but not enough for you to perform surgery…). Then, I’ll discuss the primary importance of working on this area, and finally, how to incorporate exercises for these areas into your training routine. Your lower leg is made up of the bigger tibia on the inside and the smaller fibula on the outside, then connects lower down to the talus and the calcaneus (heel), then to the five small bones of the instep and the metatarsals and phalanges (your toes). Lots of different sized ligaments connect the bones together for stability, along with various muscles from the big calf to the small muscles that move your toes. The ankle and foot is made to move in a great variety of angles to provide stability and dexterity, carrying us over all types of terrain from soft sand to rocky ground. Your ankle is not like a hinge on a door, and your foot isn’t just one big lump you slide your socks onto. All the large and small joints in this area work together to provide this nimbleness, but only if we keep them moving like they are supposed to! Our calves (the bigger gastrocnemius and smaller, deeper soleus muscles) point the foot down, giving us the power to rise up on our toes and assist with running and jumping. But even with the foot flat on the ground, our calves provide stability in squatting, lunging, and other big movements. On the front and sides of the shin are the anterior tibialis, posterior tibialis, and peronei muscles, which provide stability like stirrups and slings, and also the fine motor control that keeps us balanced and steady. Down into the foot are many small muscles that control our arches and toes. These foot intrinsic muscles are the most at risk for atrophy from disuse when we don’t actively get out of our shoes and move our feet as we’re meant to do. With all this considered, it’s easy to see the complexity of large and small muscles and joints working together to keep us upright and walking, as well as running, jumping, and balancing. The coordination and differentiation of all these possible movements is key to foot and ankle control, and to moving freely and gracefully through your feet. It’s also likely why we hear so many complaints about stiff ankles and feet. If the smaller muscles are too weak to support your foot and ankle, your body reacts by increasing the tension where it can, in the bigger muscles. The tightness in the calf and ankle is then a protective mechanism that stretching may help a bit, but improved control and strength in the foot would solve. Another common issue people experience is collapse arches in the feet. This is caused by poor mobility in the midfoot, along with weak posterior tibialis and intrinsic muscles. With improved mobility and strength in these areas, the arches should correct themselves over time. Below we’ll discuss a variety of exercises with an emphasis on coordination and dexterity to wake up dormant muscles and restore proper mobility and control over this important area. The exercises we show here have an emphasis on active movement in various angles and ranges of motion. A lot of people don’t fully explore the movement our feet and ankles are capable of, and this results in stiffness and weakness. The first step is knowing that it is actually possible to move this way, and the next and best step is to practice! Below, we’ll look at each of these exercises in detail so you can understand the mechanics and benefits of each exercise, as well as programming recommendations. This movement concentrates on the small muscles in the arch of the foot. These foot intrinsicssupport the foot, and control over them means improved control and dexterity, which is so important in graceful and athletic movement. It’s a simple movement – it’s just making a circle! – but the addition of flexing your toes makes this surprisingly difficult and can lead to muscle cramping in the beginning. Start off by not flexing your toes strongly and do the circles slowly. Do 10-15 reps in each direction for 2-3 sets. Here is another simple movement that works on coordinating the use of the muscles of the lower leg and foot. Simply lift your foot up and down through your full range of motion and add the toe movements with it as well. The coordination is toe extension (lifting toes upward) as you lift your foot upward, and toe flexion (curling in) as you point your foot down. And the other variation is then flexing your toes down as you lift your foot upward, and extending your toes as you point your foot down. Do 10 repetitions of both variations for 2 sets. These are combined motion patterns of either your foot lifting up and rolling inward and then pointing down and outward; or your foot lifting up and rolling outward and then pointing down and inward. You are essentially tracing an X with your foot as you work on the coordination of ankle and foot motions. This can be another surprisingly difficult exercise and is extremely useful for learning how your ankle can move. Do 10-20 reps for 2-3 sets. This is the first exercise where we are putting weight onto our feet. The goal here is to combine a loaded active stretch to the ankle and foot together. It’s a dynamic move, so don’t hold too long in any position, instead go slowly through the full range and back again to encourage active movement through all the positions. Do 5-8 reps for 3 sets. In this exercise, don’t worry if you can’t drop down into the full deep squat position. The purpose of this exercise is to practice rolling on the inside and outside of your feet while weightbearing in a “compromising” position. If you were to run and unexpectedly roll onto the side of your foot, you’d likely get a nasty ankle sprain. The exercise shown here is a progressive way to practice these common stresses to your feet and ankles. You can control the pressure and stress of the movement and use it to strengthen these positions to make it less likely to be severely injured when it unexpectedly happens. Here we move to standing and up on the ball of the foot as we practice rolling our ankle from side to side. Again, it’s better to do this while we are controlling the forces so we can strengthen them, rather than having it happen randomly and possibly causing injury. Continuing in standing, we’ll now practice ankle circles while placing as much weight as we are comfortable with on either our heels or on the ball of the foot. There are different forces and strains involved in the two variations, so it’s good to familiarize yourself with both. Do 10 reps in each direction for 2 sets. Another classic exercise, this is the most direct way of strengthening the calf muscles in their full range of motion from a full stretch to a full contraction. You can adjust your intensity by how much you hold on with your hands and by eventually adding weight to your body through a backpack or holding dumbbells. If this is too much for you, then work both feet at the same time or start on a flat floor versus a step to reduce the range of motion until you get stronger and can handle strengthening from the full stretch. Do 8-12 reps for 3 sets. A very common complaint we hear from people is their lack of ankle flexibility. Many bodyweight exercise moves, especially as you move into intermediate and advanced work, such as the pistol squat and various locomotive patterns, require good ankle flexibility. The calf muscles are a very dense muscle group because we use them constantly – even just in standing and walking. And the ankle joints, because of the lack of variety of motion throughout the day, tend to be stiff and immobile. This can require aggressive stretching, in terms of load, not intensity, to achieve improvements in range of motion. A classic and effective exercise is using a step or sturdy block for your foot so you can drop your heel down to stretch. It’s simple, not fancy, but works extremely well if you are consistent and approach it the right way. I recommend doing this in shoes, in this way you can place the middle of your foot on the edge of the step comfortably for the stretch. This is protective of your foot arch and allows you to put more weight into the stretch. The variations are with your knee locked out straight and with your knee bent. The straight leg version emphasizes more of a gastrocnemius stretch, and the bent knee version gives the calf muscles a bit of slack and thus puts more of a stretch in the ankle joint. The calf responds well to long holds of stretching, so 1 to 2 minutes for 3 sets should be a minimum goal. Stretch before active movement such as the strength and motor control exercises above so that your body learns to adjust and retain the new range of motion from the stretching. A bit of self massage work is very useful in the lower leg and foot to loosen some tension prior to stretching and exercise. The massage itself doesn’t make you more flexible, but it does temporarily help you feel less tight and gives you a window of opportunity to stretch further with less discomfort. Just make sure not to overdo it, the trick is to apply just enough pressure to ease tension, not push as hard as you can to force it to happen! Starting at the foot, work along the sole along the contours of the bones and feel the small muscles in you feet, keep the pressure light at first then gradually increase the pressure. If you are doing it correctly you’ll notice an easing off of tension in the muscles. You can then add more pressure and continue if you feel you need it, or move on to the next area. Move on to the sides of your shin, into the calf and the front of your shin. The calf can be especially sore to massage deeply, so be aware of this and go gradually until you get accustomed to the pressure. You can also use a ball to change the pressure and get into the muscles from a different angle. Along with being mindful of gradually increasing pressure, you should limit your time on self massage to no more than 5 minutes. Too much of a good thing is still too much. And it is much more valuable to spend the majority of your time on active exercise. Our ankles and feet are too often under-exercised and taken for granted considering how much we rely on them everyday. It’s no surprise that this neglect of their full range of motion and total potential for coordinated movement can lead to stiffness and weakness, and perhaps even pain. This article focused on simple, yet effective exercises that not only lessen the chances of potential injury, but may also reverse some damage that has already been done (barring any true injuries in need of surgery or more intensive therapy). Spend 5-10 minutes on these exercises every day, and you’re likely to feel your feet getting stronger, more flexible, and more able to handle variations in movement. 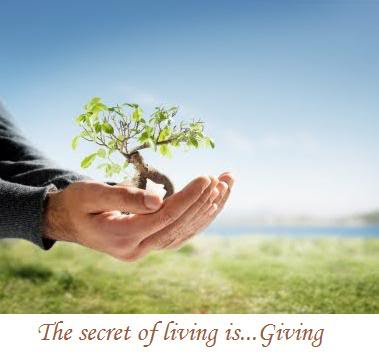 Giving of yourself — whether it be your time, energy or money — isn’t just a boon to those you’re helping. A wealth of research shows that generosity can also have benefits for the receiver, ranging from a better outlook at your job, to more years of life. Check out these science-backed reasons to make generosity a regular part of your day. It will keep stress in check. Being stingy — and ashamed of said stinginess — is linked with higher levels of the stress hormone cortisol, according to a study from social psychologist Liz Dunn. Scientific American reported on the findings of the study, which examined cortisol levels in response to giving away money, and choosing to keep more money for yourself. The more money people chose to keep in the experiment, the greater shame they felt — and the higher their cortisol levels were. While some stress is good, chronically high levels of stress have been linked to a number of health ills. Happiness at work depends on it. It’s beneficial to the greater good. You’ll enjoy more years of life. Researchers from the University of Buffalo found a link between giving and unselfishness and having a lower risk of early death. Published in the American Journal of Public Health, the findings show that helping others — whether it be by helping to run errands, watching their children or giving them a lift somewhere — is linked with a decreased mortality risk. “Our conclusion is that helping others reduced mortality specifically by buffering the association between stress and mortality,” study researcher Michael J. Poulin, Ph.D., an assistant professor of psychology at the University at Buffalo, told PsychCentral. It keeps the cycle of “good” going. Thinking about the times you’ve given of yourself makes you feel selfless and want to help others, compared with thinking of the times you’ve been on the receiving end of things, according to a 2012 Psychological Science study. In other words, thinking about times you’ve helped others will then make you want to help others again — and what can be better than that? Your marriage will be stronger. You are currently browsing the archives for the Good for Your Health category.